That’s what happens in life. Everything changes… and all you can do is keep on going, giving it everything you have. After a sudden move to the city two years ago, returning to the village in which he spent his childhood allows Atcchan to meet once more with the friends he left behind. Although he managed to keep in contact with a few people, he abandoned others without a word and has since not worked up enough courage to contact them. There are only three days to meet with his friends; spending most of your time with one person could potentially upset others. Some of the major themes covered include separation and isolation, with other themes hidden within routes. The plot varies between normal, everyday scenes to sudden, tense encounters; be prepared to wade through to the endings to see the climax of your actions. If you are looking for extreme and bloodthirsty violence then you may be disappointed; efficient and realistic slaughter is the key focus here. I have seen a similar location and time period setting for a number of horror works before – the enclosed nature of the village give the impression of a cage from which we cannot escape until the problems are solved. The writing style worked for me and there were no spelling mistakes or errors which I could spot. The first group of routes mainly focus around two characters: Noelle and Amu. Noelle is a quiet, isolated girl who transferred to the village from the city a number of years ago. Amu is the strong and loud childhood friend. The discussions between characters are normally quite harsh but fair. They try to say what they feel, even if it may hurt others. Sometimes this leads to dangerous confrontations. Most of the humour revolves around wordplay and conversational combat, with some dark comedy too. The second group of routes focus around some of the minor characters introduced in the earlier routes and explores them in more detail. Although I did not find these routes as captivating as the first half, they were still enjoyable to read. The final route of the game is mostly for fun – fan disk level shenanigans. By this point, we know the characters enough to enjoy this – as a whole the visual novel is a reasonable length. There are many endings. Most of them are significantly different enough to deserve existence, although one or two of the ‘bad’ endings could have been combined. My main problem with so many endings was that, as it did not follow an easily recognisable system, it was difficult to tell what to aim for at the decision points. The list of the endings was not very useful for navigation either; any which were not yet unlocked gave no clues, any which were merely stated the ending name. After getting through about half of the endings, I would either have to start searching each path of the decision tree in order or otherwise look up the walkthrough. I opted for the walkthrough. The number of decision points was reasonable and most of the major decisions were obvious. Getting onto some routes required correct decisions on minor choices as well. The Way We ALL GO is similar to Higurashi not just in themes and setting but also in artwork. More rather, in the original Higurashi artwork. Due to time, skill and money constraints, lower quality art assets were used in Higurashi. Many people are put-off by this style, preferring to read something with both reasonable story and reasonable artwork. Back now to The Way We ALL GO. For the CG, the art styles vary between each due to having multiple artists. Some of them are a very high quality but most are not. 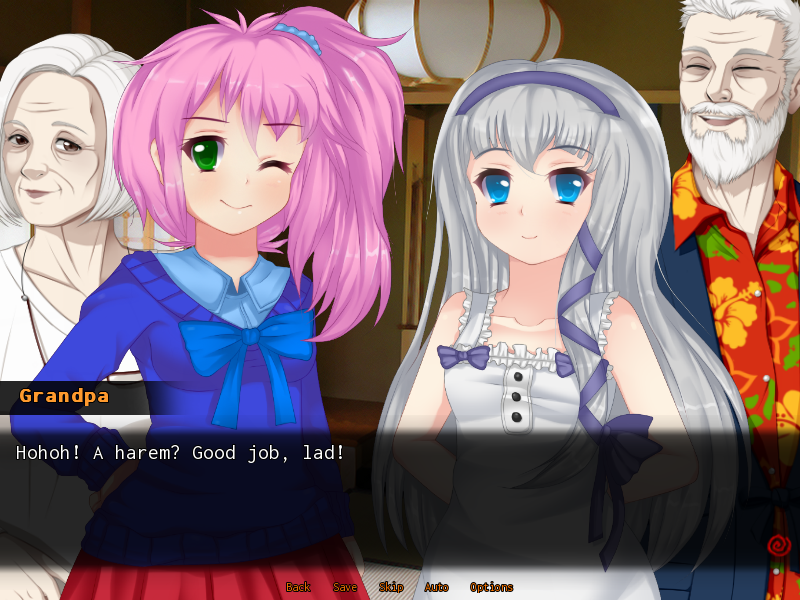 Likewise with a few of the character sprites – the grandparents are closer to the expected art quality. On a positive note, there are a variety of character expressions. Background artwork was based on various photographs freely available on the internet. With some effects applied, they are sufficient and consistent. While original drawings may be better in some cases, these backgrounds are still suitable. As for the background music, there is a good variety to fit every atmosphere. The creepy music works very well to build tension. Music was taken from various royalty free sites but they still work well together. Sound effects were also taken from royalty free sites. The ‘cut-in attack’ feature was probably my favourite sound effect. An ending list, CG gallery, music gallery and character profiles are available to view in the extra section. As discussed previously, the endings are relatively hard to locate but at least the list allows you to check that you have completed them all. Some of the graphics from the final route are missing from the CG gallery at the moment; everything else is still there, with basic functionality. Music gallery also works but may benefit from a slight reorganisation into a scrolling table format. The character profiles are a great touch. However, they did not unlock until I had finished the game. If possible, profiles which evolve as you meet characters and view endings may have improved the feature. To summarise, focus was placed in the right area; developing a good story with good characters. Difficult themes are covered and the length gives you enough time to engage with the characters. Whereas the artwork and reliance on free resources does let the overall image down, it was not too distracting. If you are willing to overlook the appearance and read the story then there will be no regrets.